For beginner cooks with hectic schedules, Do-It-Yourself pizza is a quick and tasty weeknight dinner solution. In the time that it takes to have pizza delivered, you can actually make your own! and whatever toppings you like. The nice thing about DIY pizza is that you can have fun personalizing it. You can incorporate your favorite flavors and textures, or whatever happens to be in the fridge. There’s no fixed recipe to follow! Let’s get started. Ready-made crust: The bread section of the grocery store typically offers several brands of ready-made crusts that you simply top with whatever you like and bake according to the instructions. Some of these crusts even come with a package of tomato sauce! They’re usually sold in rounds that make enough for several people. If you like thin-crust pizza, you can’t get thinner than this! It’s a good idea to pre-heat the tortilla in a toaster oven or regular oven at 350F just for a few minutes to make it a bit more solid, then turn the oven up to 450F. Put the wrap(s) on a foil or parchment paper-lined baking sheet. 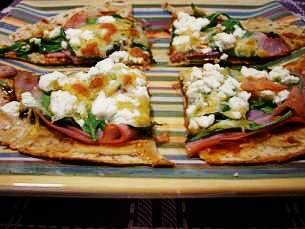 Tortillas are the base for Humbecue Pizzas — dressed with hummus, barbecue sauce, spinach, ham and feta cheese. Photo courtesy of Jenn at Eating Bender. Then add whatever sauce, cheese and toppings you like. Go easy on toppings so that the whole thing doesn’t get soggy. Put the tortilla in the oven for 10 minutes and check to see when it’s done – the edge of the tortilla should become brown and crispy. Here’s a recipe for Humbecue Tortilla Pizzas, which are made with hummus, barbecue sauce, spinach, ham and feta cheese. 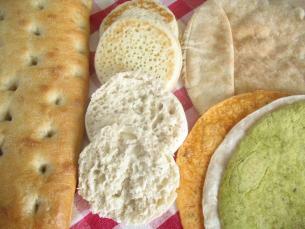 Pita bread is another great option for those who like thin, crispy pizzas. There’s no need to toast the pita before putting on the toppings; follow the same baking directions as with the tortilla pizza. Here, plain old pita gets dressed up with Italian sausage, peppers and carrots. 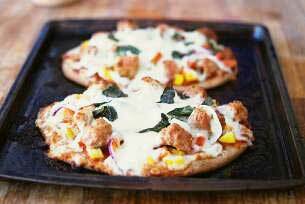 This Pita Pizza (shown above) topped with Italian sausage, peppers and carrots looks simple and scrumptious. For a more substantial crust, use focaccia bread, which is often sold in big rectangular pieces. When it comes to baking the pizza, preheat the oven to 450F and cook for 10 to 15 minutes. Here at startcooking.com we have already posted a video on English Muffin Pizzas, which are topped with tomato sauce, ground beef and cheese. These mini pizzas are irresistible, and if you don’t have any ground beef on hand, you can make them with tuna. 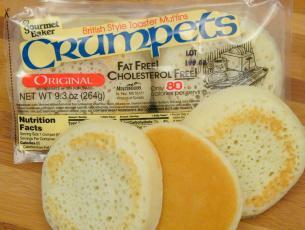 If you would prefer to substitute crumpets for English muffins, go right ahead, old chap! A lot of bagel shops now have bagel pizzas. Making your own is easy as long as you have the necessary ingredients on hand! 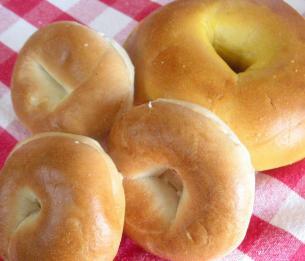 Buy your bagels ahead of time and store them (sliced!) in the freezer. 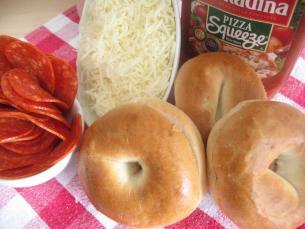 Bagels freeze beautifully as long as they are wrapped tightly in plastic wrap and then put in a zip lock bag. Pizza traditionally has a layer of tomato sauce between the crust and the cheese. 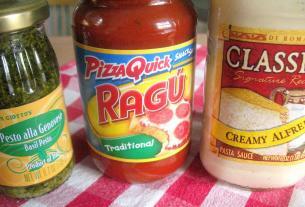 You can buy ready-made pizza sauce in a can or jar, or use tomato sauce (the kind you would use for pasta). If you don’t have either of these on hand, you could try tomato paste or salsa. Some pizza lovers prefer their pizzas “white” – with no tomato sauce. White pizzas may be topped with pesto, ricotta or Parmesan cheese and pine nuts. Or with alfredo sauce (which you can buy ready-made) and other toppings. 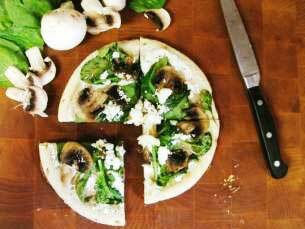 In this recipe for Spinach, Mushroom and Goat Cheese Pizza , from Cooking By the Seat of my Pants, the sauce is a combination of sour cream and Greek vinaigrette. Spinach, mushroom and goat cheese pizza — not something you see on a takeout menu! Photo courtesy of Jerry D. Russell at Cooking by the Seat of my Pants. If you love basil, try Pioneer Woman’s version of pizza using pesto rather than tomato sauce, fresh mozzarella, tomatoes, basil and parmesan. Mild: Most pizza places use mozzarella cheese, which turns nice and gooey when it melts, and has a very mild flavor. 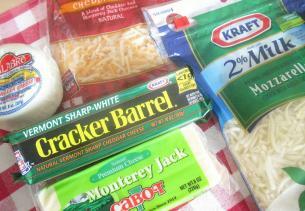 Other mild cheeses that can substitute for mozzarella are colby, cheddar, gouda, edam and Monterey jack. You can grate the cheese yourself or buy bags of pre-grated cheese. Ricotta, bocconcini and fresh mozzarella are other mild options that offer a gourmet twist because of their rich, milky textures. Strong: Try mixing mozzarella with stronger-tasting cheeses, or going for something really distinctive. You’ll find that you can use a smaller amount of cheese if it’s strong-tasting. In our video on English Muffin Pizzas, startcooking.com suggests blue cheese with chopped fresh sage and walnuts. Some other strong cheeses to try are: parmesan, provolone, goat cheese, aged cheddar and gorgonzola. This is where you can really make a pizza your own. Here’s a list of topping ideas to get you started, as well as some great-tasting combinations. Tip: Any meat toppings should be cooked before being added to the pizza. Good luck with your pizza creations! What a great post! I just posted about pizzas using the new Pillsbury thin crust, but I have tried Boboli for breakfast pizza and english muffins for a lunch pizza. Great inspiration using tortillas as a very thin crust!! Hi Kathy….is there a substitute for parchment paper? We always have all sizes of tortillas at our house but alas NO paper? HELP!! 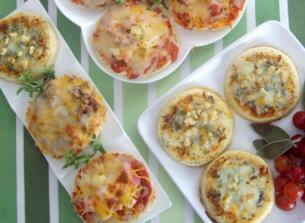 English Muffin Pizzas were an occasional Sunday- night-supper-family-treat when I was growing up. (My mom would always cook a roast with all the trimmings for the big Sunday lunch.) My Dad was usually in charge of making the Pizza and we all loved it! To this day I can’t make them without thinking of my Dad! Cynthia, it all depends on what you are cooking. For a tortilla, use tin foil instead. Mmm…pizza!! This post has some really great tips, thank you for sharing! And an even bigger thanks for including one of my recipes I just sent you an email! Jenn, your recipe is a big hit – thanks for sharing! 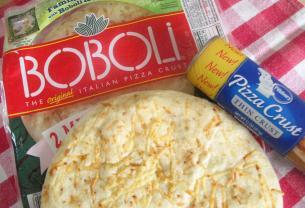 I have made Pizza using the Boboli crust before and yes it’s super simple. Now I would like to advance and try to make my own crust. I gave it a shot today, but the written instructions online are confusing if you have nevermade dough before. Would you mind to post a video on how to make pizza crust? Making one’s own pizza crust is a great idea BUT we do have to remember this site is called “startcooking”! Working with yeast can be tricky for a beginner, but I will add it to the ever growing list of requests! Pizza crust is easy to make for beginners if you have a bread machine. You still have to stretch the dough, but you’d have to do that if you bought pizza dough from a pizza parlor. And with a bread machine, all the kneading is done in the machine. Thanks for the great tip! Unfortunately most beginner cooks do not own a bread machine. In fact, I have discovered that a blender is usually the most common piece of kitchen equipment. Thanks 4 the great idea- pizza is my favorite junk food!! After reading this, i’ve made my own pizza at least 3times already using ragu pizza sauce & pita bread with various toppings – i luv em! & so do my friends! Who needs 2order out? Very easy to make – Wow! Even got my husband, who has NEVER had pizza in his life, taste it & now eating it too!! (Never succeeded in getting him to try pizza until now for 7yrs! – I guess actually seeing it being made did the trick). This sight is great – simple, clear, easy-to-follow instructions & videos! Thank you! One more thing: I brush olive oil (just because this is what I buy) on both sided of the pita bread b4 adding the toppings. Not sure if it makes a difference with how the crust turns out, as i’ve not tried it without it. That’s great news! Thanks for the olive oil tip – I’ll have to give it a try.